The Sangeet Natak Akademi, National Academy of Music, Dance and Drama, the apex body of performing arts in the country selected 66 artists of India (including two joint award) who have made a mark as young talents in their respective fields of performing arts for USTAD BISMILLAH KHAN YUVA PURASKAR 2013 & 2014. The Puraskar is given to artistes below the age of 40 years and carries a purse money of Rs.25,000. The awards were given in Agartala in December 2015. 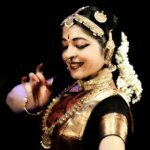 In the field of dance, sixteen recipients of Yuva Puraskar are: Lavanya Shankar and Lakshmi Parthasarathy Athreya in Bharatanatyam; Souvik Chakraborty and Sandeep Mahavir in Kathak; Kalamandalam Arun Warrier in Kathakali; Prateeksha Kashi and M. Jaikishore Mosalikanti in Kuchipudi; Rajashri Prahraj in Odissi; Mridusmita Das and Anwesa Mahanta in Sattriya; Saji Menon in Mohiniattam; Satish Kumar Modak and Lokanath Das in Chhau; Vikram Iyengar in Contemporary Dance; Sangeeth Chakyar in Other Major Traditions of Dance and Dance Theatre (Kutiyattam); Ramamohanan N.N. in Music for Dance. Ramu Endowments supported by TAG Group of Companies, Chennai, presents LIFETIME ACHIEVEMENT AWARD and a purse to S. Natarajan for his selfless service to Bhagavatha Mela, on December 27, 2015 at Tag Centre, TTK Road, 10.30am. The award function will be followed by a lec-dem on M.S. Subbulakshmi by V.Sriram. In recognition for his 69 years of service to Bhagavatha Mela, Sri Krishna Gana Sabha presented NATYA KALA MANI award on S. Natarajan, at the inauguration of its 35th Natya Kala Conference on December 26, 2015 at the Sabha premises in Chennai. Lalitha Kalalayam Nambisan received KALA DARPAN Jwala 2015 Award from South Indian film producer/director K. Madhu organised by Jwala Publications on December 26, 2015 at Mumbai. Trinity Arts Foundation (of Memphis USA) conferred BHARATA KALA RATNA AWARD on Lakshmi Vishwanathan, Avanti Meduri and Rama Vaidyanathan on December 24, 2015 on the opening day of their fest at Chettinad Arts School, Chennai. Kala Bharathi of Vizag presented NRITYA KALA BHARATHI Award to Bala Devi Chandrashekar from New Jersey for her contribution to Bharatanatyam, on December 18, 2015. 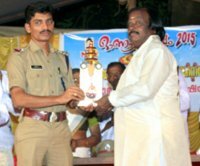 Kartik Fine Arts presented VIDWAN MADURAI N KRISHNAN MEMORIAL AWARD and title of MADHURAKALAMANI to Guru Padma Srinivasaraghavan of Silambam (Chennai) on December 17, 2015 at Bharatiya Vidya Bhavan, Chennai. Kalyana Krishna Foundation presented the KALYANA KRISHNA ENDOWMENT AWARD to Margi Vijayan and KKF CHANGARAPALLY ANIYAN MEMORIAL AWARD to Kalamandalam Shanmughan for Kathakali vesham on December 11, 2015 at Kochi. External Affairs Minister of India, Sushma Swaraj gave Milena Salvini, an eminent Kathakali dancer from France, the ICCR DISTINGUISHED ALUMNI AWARD 2015 in absentia in New Delhi on December 10, 2015. Nepathya conferred the APPUKUTTAN NAIR MEMORIAL AWARD on mizhavu and thimila artiste Kalamandalam Ratheesh Bhas on December 6, 2015 at Aluva, Kerala. Guru Padmini Ravi (Bangalore) for RUKMINI DEVI AWARD for Significant contribution to BN; Guru Radha Shridhar (Bangalore) for MAYA RAO LIFETIME AWARD for having served art for a lifetime. The awards ceremony were held as part of 6th year of Dance DISCourse Series in collaboration with Alliance Francaise de Bangalore and Bangalore School of Music on 5th December 2015 at Alliance Francaise de Bangalore. The ITM Group conferred LIFETIME ACHIEVEMENT AWARD on November 28, 2015 at Nehru Centre, Mumbai on dance theorist and critic Dr. Sunil Kothari, Dr. Kanak Rele, Dr. Darsana Jhaveri, Sunaina Hazarilal and Kalyanasundaram Pillai. The award consists of a silver plaque, shawl and cash prize. 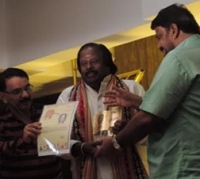 At IDA 2015: Eka Aneka festival, the LEELA SEKHAR MEMORIAL AWARD was presented to Churchill Pandian (journalist, director and producer) on November 22, 2015 at ADA Rangamandira, Bangalore. 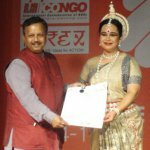 Anitha Guha’s Bharatanjali Trust awarded the Indian dance portal www.narthaki.com for its path breaking work in the world of dance on November 15, 2015 at Chennai. Seen in the pic are Anitha Guha, Narthaki’s founder Dr. Anita Ratnam and scholar VAK Ranga Rao. 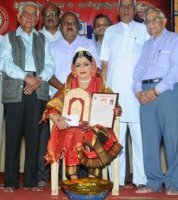 Lavanya Sankar’s Abhyasa Academy of Classical Dance conferred ABHYASA NRITYA VARDHINI on Bharatanatyam dancer Umaa Nambudripad Sathyanarayanan on November 15, 2015 at Bharatiya Vidya Bhavan, Coimbatore. Kalamandalam honoured the following. 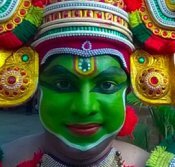 Kathakali artiste Mathur Govindan Kutty has been selected for the KALAMANDALAM FELLOWSHIP for 2014. The fellowship carries a purse of Rs.35,000. Koodiyattam maestro Kalamandalam Sivan Namboodiri is to receive the KALARATNAM AWARD that carries a purse of Rs. 10,000. The other award winners: Kalamandalam Ratheesan (Kathakali Vesham); Kottakkal Narayanan (Kathakali Sangeetham); Mankulam Krishnan Namboodiri (Chenda); Kottakkal Ravi (Maddalam); Kalamandalam Balan (Chutty); G. Chandrasekharan Nair (Mrudangam); Kalamandalam Pushpalatha (dance); Sankunnikutty Nair (Krishnanattam); Kalamandalam Mohana Krishnan (Thullal); Kalamandalam Sathybhama ( Posthumous- best art book); Mathew Paul (best documentary); Manalur Gopinad (Thullal - Dr. V.S. Sarma Endowment); Kalamandalam Bagyanathan (Kathakali - Bhagavathar Kunjunny Thamburan Endowment); Kalamandalam Sangeeth Chakyar (Koodiyattam- Yuva Prathibha award); and Kalamandalam Gishnu Prathap (Koodiyattam - Painkulam Ramachakyar Award). The awards were presented at Kerala Kalamandalam on November 9, 2015. The Dhananjayans received BHARATAKALASHRESHTA award from Saradhi (founded by Kala Sasikumar), a cultural organization celebrating its 15th anniversary, from former governor of West Bengal M.K. Narayanan on November 8, 2015 at Chennai. Kathak guru Chitra Venugopal, disciple of Guru Shambu Maharaj and Dr. Maya Rao, received the KARNATAKA RAJYOTSAVA AWARD for dance on November 1, 2015 at Bangalore. She was the only person from the dance realm to get it this year. She was a lead dancer in her heydays at the Sriram Bhartiya Kala Kendra and the Natya Institute of Kathak and Choreography and taught dance in Cairo, the UK and India. She has come back from a self imposed retirement to teach at the Natya Institute again since 2014. SUNAINA (Society for the Upliftment of the National Arts of India) conferred GURU SAMMAN AWARD on Radha and Raja Reddy (Kuchipudi), Geeta Chandran (Bharatanatyam) and Uma Sharma (Kathak) at its Indradhanush Dilli Festival at Delhi from October 26 - 28, 2015. Sridevi Nrithya Kendra conferred NATYAKALA TAPASWI on the Dhananjayans on October 25, 2015 at SDM College Auditorium, Mangalore. The General Council of the Sangeet Natak Akademi, the National Academy of Music, Dance and Drama, New Delhi elected 4 eminent personalities in the field of performing arts, namely S.R. Janakiraman, M.S. Sathyu, Vijay Kichlu and Tulsidas Borkar as Sangeet Natak Akademi Fellows (Akademi Ratna). The Fellowship of the Akademi is the most prestigious and rare honour, which is restricted to a very limited number at a given time. Presently there are only 40 Fellows of the Sangeet Natak Akademi. The General Council of the Akademi also selected 36 artists from the fields of Music, Dance, Theatre, Traditional / Folk / Tribal Music / Dance / Theatre & Puppetry and Overall contribution/scholarship in Performing Arts for the Sangeet Natak Akademi Awards (Akademi Puraskar) for the year 2014. 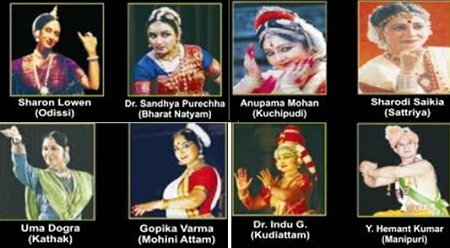 Dance: A Janardanan for Bharatanatyam, Uma Dogra for Kathak, N. Amusana Devi for Manipuri, Vedantam Radhesyam for Kuchipudi, Sudhakar Sahoo for Odissi, Anita Sharma for Sattriya, Jagru Mahato for Chhau, Navtej Singh Johar for Contemporary Dance and Varanasi Vishnu Namboothiri for Music for Kathakali. Music: Ashwini Bhide Deshpande, Ustad Iqbal Ahmed Khan and Shri Nath Narelkar for Hindustani Vocal Music, Pt Nayan Ghosh for Hindustani Instrumental Music (Tabla), Pt Ronu Majumdar for Hindustani Instrumental Music (Flute), Neyveli Santhanagopalan for Carnatic Vocal Music, T A Kaliyamurthy in Carnatic Instrumental Music (Thavil), Sukanya Ramgopal in the field of Carnatic Instrumental Music (Ghatam) and Dwaram Durga Prasad Rao in the field of Carnatic Instrumental Music (Violin). Theatre: Asgar Wajahat for Playwriting, Surya Mohan Kulshreshtha and Chidambar Rao Jambe for Direction, Debshankar Haldar and Ramdas Kamath for Acting, Amod Bhatt in Allied Theatre Arts- Music for Theatre, Manjunath Bhagwat Hostota for Other Major Traditions of Theatre (Yakshagana) and Amardas Manikpuri for Music for Theatre- Chattisgarh. Traditional/folk/Tribal Music/Dance/Theatre & Puppetry: Puran Shah Koti for Traditional Music of Punjab, K Kesavasamy for Puppetry (Puducherry), Kalamandalam Ram Mohan for Make-up/Costume for Kathakali, Reba Kanta Mohanta for Mask Making of Assam, Abdul Rashid Hafiz for folk music of Jammu & Kashmir, K Shanathoiba Sharma for Thang-Ta of Manipur, Ramdayal Sharma for Nautanki of Uttar Pradesh and Thanga Darlong for Folk Music of Tripura. Overall Contribution/Scholarship to Performing Arts: Akshara K.V and Indudhar Nirody. The honour of Akademi Fellow has been conferred since 1954 and Akademi Award since 1952. They not only symbolize the highest standard of excellence and achievements on a national basis, but also recognize sustained individual work and contribution to the practice and appreciation of the arts through performance, teaching and scholarship. The honour of Akademi Fellow carries a purse money of Rupees three lakhs and Akademi Awards carry Rupees one lakh, besides Tamrapatra and Angavastram. The awards were presented by the President of India on October 23, 2015 at Delhi. Evoor Damodaran Nair Smaraka Trust, Alleppy, conferred the EVOOR DAMODARAN NAIR AWARD 2015 on Ottanthullal artiste Suresh Kaliyath for outstanding young performer in the field of performing arts on October 18, 2015 in Alleppy. In its 30th anniversary year, Milapfest has started a new initiative to recognize and celebrate the remarkable work of British arts professionals who have rendered distinguished service for promoting and strengthening the provision of Indian Arts and Education in Britain. Milapfest also recognizes the importance of supporting the youth of Britain and congratulating their hard work, dedication and passion in the practice, performance and propagation of Indian classical arts in Britain. The awards were presented on 8th October 2015 at the Nehru Centre in London. The High Commissioners of India and Sri Lanka, as well as the DCEO of the Arts Council England presented the awards. Devdasi Nrutya Mandir presented DEVDASI NATIONAL AWARD during its Devdasi Festival from Oct 5-7, 2015 at Bhubaneswar. The awardees are: Sharon Lowen (Odissi), Dr. Sandhya Purecha (Bharatanatyam),Gopika Varma (Mohiniattam), Anupama Mohan (Kuchipudi), Sharodi Saikia (Sattriya), Uma Dogra (Kathak), Dr. Indu G (Koodiyattam) and V Hemant Kumar (Manipuri). RADIO RANGA MANDIRA by Ranga Mandira School of Performing Arts and Research Academy broadcast from Chennai will bring special programs on arts and society both as live broadcasts and curated podcasts. It was inaugurated on Oct 3, 2015 along with TV Ranga Mandira, a dedicated channel that carries news reels, footage, travelogues, memoirs and much more. The Angikam Foundation, Toronto (headed by Natya graduate Deepti Gupta), created the MAYA RAO AWARD FOR INNOVATION IN KATHAK for the diaspora community in Canada. The first one was awarded in September 2015 to Kathak dancer, choreographer and guru Joanna D’Souza, Chitresh Das’s prime disciple. Joanna has been Artistic Director of M-DO / Kathak Toronto since 1988, and main choreographer for Chhandam Dance Company since 2003. As a teacher, she continues to mentor students locally, nationally and internationally, and is artistic leader of HeartBeat, a drum and dance program for Ontario based public schools, funded through the Ontario Arts Council-Education Office. For the last 20 years GURU KELUCHARAN MOHAPATRA AWARD has been presented by Srjan on an annual basis in the field of dance, music, theatre and cinema to exceptional individuals. The award carries Rs 50,000 each and a citation. The award for 2015 was presented to Guru Giridhari Nayak in the field of dance and Dr. Shantanu Mohapatra in the field of music on September 9, 2015 at Bhubaneswar. NOC, a cultural organization at Nelluvaya in Trichur District, presented the first award in memory of Kerala maddala legend Trichur Vasu Variar KALA VIPANCHIKA AWARD to Mumbai based percussion artist Lalitha Kalalayam Nambisan for his valuable contribution of 45 years to the Mumbai art field. Aditi Mangaldas Dance Company has been commissioned by Dance Umbrella, UK for a new production to be premiered in India and the UK in 2016. Neila Sathyalingam, founder and director of Apsaras Arts was honoured with the LIFE TIME ACHIEVEMENT citation at the Samarpana festival 2015 on 21st August 2015 at the Esplanade Concert Hall, Singapore. Sai Arts International presented the following awards on August 1, 2015 at Bangalore: GURU K SHIVA RAO AWARD to M. Gopal (Sagara), GURU H.R. KESHAVAMURTHY AWARD to K. Chandraekhara Nevada, GURU PADMINI RAO AWARD to Sathyanarayana Raju, GURU U.S. KRISHNA RAO & CHANDRABHAGA DEVI AWARD to Kiran Subramanyam and Sandhya Kiran, GURU V.S. KOUSHIK AWARD to Subhashini Vasanth, GURU NARMADA AWARD to Chethana Radhakrishna, GURU LEELA RAMANATHAN AWARD to Kripa Phadke. 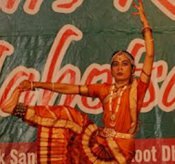 Vasanti Joshi of Vadodara got FIRST PRIZE in the Bharatanatyam Dance Competition held at Mohan's Rang Mahotsav on 31st July 2015 at Mathura (UP). On 24 July 2015, Natyarangam, the dance wing of Narada Gana Sabha, Chennai presented OBUL REDDY ENDOWMENT AWARD to dance duo V Balagurunathan and Gayatri Balagurunathan, VASANTHALAKSHMI-NARASIMHACHARI ENDOWMENT AWARD for talent promotion to Bhavajan Kumar, SUDHARANI RAGHUPATHY ENDOWMENT AWARD to K Rajasekaran (vocalist and nattuvanar). Arsha T.S, disciple of Guru Kalamandalam Remani Haridas, got FIRST PRIZE in the Dance Competitions held in connection with the 48th Shri Jagannath Rath Yatra Mahotsav held on July 23, 2015 at Shri Jagannath Mandir, New Delhi. 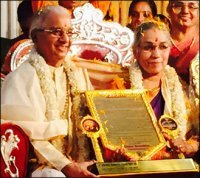 On July 5, 2015 the SKGS YAGNARAMAN LIVING LEGEND AWARD was conferred on Dr. Yamini Krishnamurthy, the SKGS YAGNARAMAN AWARD OF EXCELLENCE on Lakshmi Gopalaswamy (Bharatanatyam), Subhasri Ramachandran (vocal), Anirudh Athreya (kanjira) during the Yagnaraman July Fest at Krishna Gana Sabha, Chennai. Geeta Chandran has been appointed Member of the Philatelic Advisory Committee, Department of Posts, Ministry of Communications and IT (for 2 years, 2015-2017). Dr. A.V. 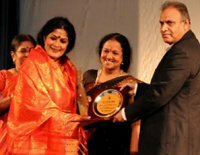 Satyanarayana’s Shrishti organization gave SHRISHTI NATIONAL ACHIEVEMENT AWARD to Kathak maestro Pt. Birju Maharaj on May 10, 2015 at Bangalore. Kalasagar celebrated the 91st birth anniversary of its founder, Kalamandalam Krishnankutty Poduval by honoring the following artistes on May 28, 2015 at Edappally, Kerala. The Journalists Federation of India has announced the 22nd JAI WOMEN NATIONAL AWARDS for 2014. Among the awardees are Kathak dancer Sharmistha Mukherji for Social Work, and Bharatanatyam dancer Geeta Chandran for the Performing Arts. The Dhananjayans were honoured with GURUSRESHTA award by the Peravoor Kalamandir College of Fine Arts (Kerala) during their annual Nataraj art festival on 29th April 2015. The Department of Performing Arts at Alliance University in Bangalore bestowed NRITHYA SARASWATHI award on Chitra Visweswaran, Lakshmi Vishwanathan, Ananda Shankar Jayant, Dr. Anuradha Jonnalagadda and Geeta Chandran. The NRITHYA BRAHMA honour was conferred on Vempati Ravi Shankar and NRITHYA VACHASPATI on Dr. Sunil Kothari. The Chancellor of the University, Dr. Madhukar G. Angur, gave away the honours at an event in Bangalore on 27 April 2015. Rachana Sansad / Brahmnaad Academy conferred the following awards at its Brahma Vasant Utsava on April 26, 2015 at Mumbai. BRAHMA RATNA on Hema Malini and Dr. Kanak Rele; BRAHMA PADMA on Darshana Jhaveri, Dr. Sunil Kothari, Ashit Desai, Dr. Sandhya Purecha and Dr. BM Sundaram; KANAK RATNA on Deepak Majumdar; KANAK BHUSHAN on Keertana Ravi, Rupak Mehta, Mugdha Mane and Neha Muthiyan. Arts presenter Usha RK has joined as Member Secretary for Intangible Cultural Heritage, Ministry of Culture/UNESCO as on April 25, 2015 at Delhi. In Aekalavya season 7, Lasyakala presented AEKALAVYA SAMMAN 2015 to Arupa Gayatree Panda (Odissi) and Nupur Dhananjay Daithankar (Bharatanatyam) on March 30, 2015 at Rabindra Mandap, Bhubaneswar. Sanjukta Wagh’s dance theatre performance RAGE AND BEYOND: IRAWATI’S GANDHARI won two MAHINDRA EXCELLENCE IN THEATRE AWARDS (META) for Best Actress and Best Innovative Sound Design (Hitesh Dhutia), at the META Theatre Festival, New Delhi, on March 27, 2015. Odissi dancer Anitha Babu has been awarded the REX Karmaveer Global Fellowship (RKGF) for 2015 on 23rd March at the Rex Conclave held in New Delhi. US based Bharatanatyam dancer Puja Allepalli was awarded the YUVA KALA RATNA on March 22, 2015 by Sahitya Kala Seva Mandal and Dr. Pankaj Chande (Former Dean of Arts Department, Nagpur University and current Vice Chancellor of Sanskrit University). GURU SRESHTHA titles were conferred upon Guru Ratnam Janardhanan and late Guru Adyar K Lakshman at Scientific Hall, Nagpur. Women’s Voluntary Service of Tamil Nadu honored ‘Sruti’ S. Janaki as a woman achiever on March 7, 2015 at World University Service Centre Auditorium, Chennai. Shambhavi School of Dance conferred the NATYASASTRA AWARD on Kuchipudi Guru Sobha Naidu on March 7, 2015 at Bharatiya Vidya Bhavan, Chennai. Alarmel Valli received the MN SUBRAMANIAM AWARD under an endowment instituted at the Music Academy by family members of the late MN Subramaniam on March 6, 2015. 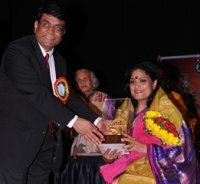 The KJ SARASA MEMORIAL AWARD was given to dance vocalist Girija Ramaswamy on February 20, 2015 by Sarasalaya on the opening day of the Sarasa Natya Mala festival, Chennai. Commemorating Valentine’s day Culturama Magazine - Global Adjustments India honored the Dhananjayans with the ART OF LOVING award on Feb 13, 2015 at Chennai. The Dhananjayans were awarded the GURUVANDANAM plaque by Venu Parameswar and Unnikrishnan (Kaavya Arts Center, Dubai) on 6th Feb 2015. Chennai based Bharatanatyam dancer Kavitha Ramu has been appointed as General Manager, Tamilnadu Tourism Development Corporation. According to an order issued by the Union Ministry of Culture dated January 28, 2015, Shekhar Sen has been appointed as Chairman of Sangeet Natak Akademi for a term of 5 years with immediate effect. Shekhar Sen is an eminent singer, actor, theatre director, composer and lyricist. Dr. Mitul Sengupta, Director, Rhythmosaic Kolkata, received NATIONAL NRITYA SHIROMONI AWARD 2015 from Cuttack Mahotsav for her contribution in the field of Kathak dance on January 5, 2015 in Odisha. Vasanti Joshi (Nrutya Rajeshwar, Baroda) received NATIONAL NRITYA SHIROMONI AWARD 2015 from Cuttack Mahotsav for her contribution in the field of Bharatnatyam dance on January 5, 2015 in Odisha. Dr. Vasundhara Doraswamy received the NATYA BRAHMA title at the Diamond Jubilee Celebrations of Nadabrahma Sangeetha Sabha at Mysore on January 4, 2015. The Music Academy conferred SANGITA KALANIDHI award on eminent vocalist and mridangist 82 year old T.V. Gopalakrishnan popularly known as TVG, on January 1, 2015, at the Sadas. 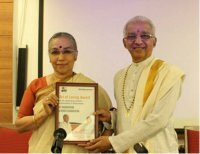 The Music Academy presented Bharatanatyam dancer Leela Samson with NATYA KALA ACHARYA at the inaugural function of the Dance Festival on January 3, 2015.